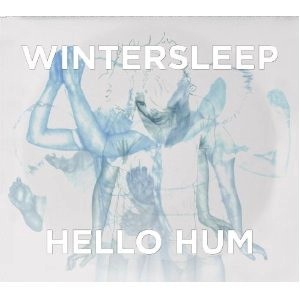 Halifax NS native alt-rockers Wintersleep chose Scottish producer Tony Doogan (Belle & Sebastian, Mogwai) and Dave Fridmann (Flaming Lips, MGMT) to flesh out their fifth studio effort Hello Hum. As a band that has never been particularly concerned with being radio friendly, Wintersleep continues to follow their instincts – the series of tunes occasionally difficult to differentiate. On foggy opener “Hum,” we receive a fuzzed-out intro track that sets the tone for the album. The lyrics here provide a regretful sentiment: “Hello hum. I am the dying lung of the town you left / I was beginning to fear, beginning to fear that you would never come back.” Up-tempo “In Came The Flood” brings the sunshine back in, and holds the most commercial appeal of the bunch – steaming the album full speed ahead. Like past single “Weighty Ghost,” this may be their ticket to an alt radio hit. Taking a breather on “Saving Song,” lead singer Paul Murphy’s husky vocals propel the track slowly as the guitar and drums amplify to match him. Hello Hum, in typical Wintersleep fashion, functions better as a collective whole. Put it on the next time you’re on a night drive and don’t stop until the record plays out. If you like what you hear, do it again.